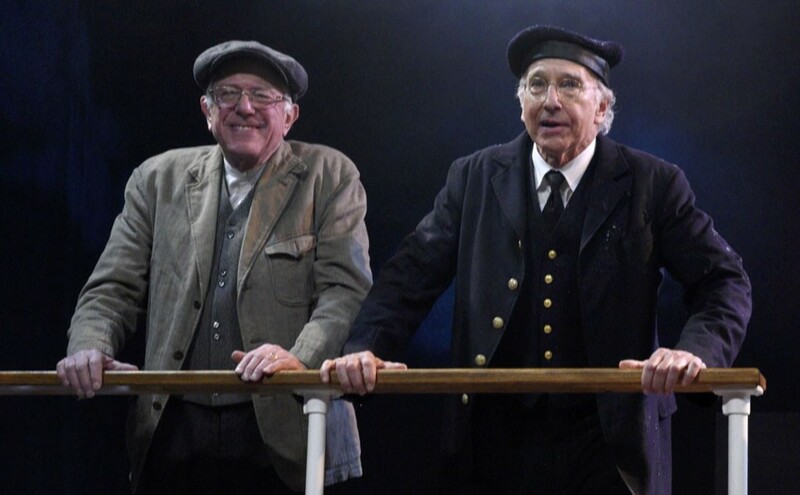 Sen. Bernie Sanders (left) and Larry David on "Saturday Night Live"
Fan were tickled last year when funnyman Larry David delivered a pitch-perfect portrayal of Sen. Bernie Sanders (I-Vt.) on "Saturday Night Live." Now we're learning just why the impression was so spot-on. A PBS program revealed last week that the balding, bespectacled older white men are actually cousins — distant ones, but cousins nonetheless. And neither could curb his enthusiasm when he found out the big news. "You're kidding! Oh, my God. That is unbelievable!" Sanders exclaimed when "Finding Your Roots" host Henry Louis Gates Jr. revealed the familial connection. "What the hell!" yelled his relation, when told the same news during a different interview. "All right, cousin Bernie." Here's what we knew before. Both men are Jews born and raised in Brooklyn — Sanders, 76, in the Flatbush section and David, 70, in Sheepshead Bay. Their respective paths diverged in college: Sanders took to politics at the University of Chicago while David discovered history — and humor — at the University of Maryland. But researchers with the PBS program found that both had Polish ancestors, many of whom were killed by the Nazis during the Holocaust. David also learned that his paternal great-grandfather emigrated from Germany, settled in Alabama and fought for the Confederacy in the Civil War. That relative also owned slaves, much to David's dismay. The researchers did not find a specific relative that the two men share but instead used DNA testing to prove that they are cousins, according to Gates. Sanders and David are each about 98 percent Ashkenazi Jewish. Despite their obvious similarities, both men were in a state of disbelief. "People ... talk about Larry David, and I say, 'He does a better Bernie Sanders than I do,'" Sanders said with laugh. As for a Larry David impression? "Yeah, I'm me, I'm doing it," Sanders replied. "I thought it's pretty good." The original print version of this article was headlined "Cousinly Love"